It is well-established that the UK’s prison population is ageing, but there is more to be said about changing demographic trends across the whole length of the criminal justice system, from charge through to rehabilitation. In this blog mini-series, Sally Bowell explores age-related trends in offending and discusses their implications. It has been widely acknowledged that the prison population in England and Wales is ageing. As shown in Figure 1, in the last year alone there was a 4% increase in prisoners aged 60 and over and a 7% increase for those aged 70 and over. This is at odds with a general reduction in other, younger age groups. Source: Ministry of Justice, Offender Management Statistics. Note that 50 and over is typically used in the literature to define the ‘older’ prison population, given poor life expectancy. To put this into context, in March 2018, out of a total of around 83,000 prisoners, roughly 13,500 were aged 50 and over. There has been an increase in the number of people recalled to prison while out on ‘license’ (released towards the end of a sentence but under certain conditions). As Figure 2 shows, the rate of deaths from natural causes has increased in recent years. Some of these prisoners will need end of life and/or palliative care, and there will be implications both in terms of healthcare management, but also for staff, friends and family members. 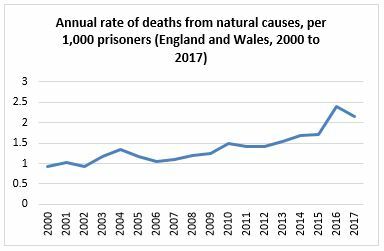 There is currently high variability in the quality of palliative care in prisons, with no national policy or guidance. Older prisoners carry a greater risk of experiencing social isolation, in particular due to disability which often means that they are unable to participate fully in prison life and have lost contact with friends and family. Socially isolated older prisoners may prove more challenging to rehabilitate, may struggle to reintegrate upon release and may divert limited resources. As the number of older prisoners increases, so too will the number with dementia. There are many complex issues involved in this, for example in achieving a diagnosis, receiving entitlements to social care, adherence to prison routines and timetables, comprehending an increasingly confusing environment and ensuring that staff have the appropriate training and skills. Additional, under-researched potential implications include ageism and discrimination in the prison system, as well as defining the health and care cost implications of ageing behind bars. The changing face of those living behind bars will present challenges over the coming years, for prison staff, policy-makers and the courts. The needs of older prisoners must be adequately understood and catered to in order to ensure the appropriate distribution of resources. Creating a national strategy for older prisoners would be a valuable first step in ensuring that this demographic shift does not further contribute to pressure on our prisons. The second instalment in this mini-series will look at the changing demographic profile of those going through the courts and being convicted of a crime, unpicking the trend of increased convictions for older adults, which is at odds with younger age groups. Sally joined the International Longevity Centre as a Research Fellow in May 2017. Her work at the think tank has focused predominantly on health & social care, looking at topics such as music-based interventions for people with dementia, ageism in the breast cancer care pathway, and innovation in physical and mental health.